Michael Moon sell property in Marbella, Estepona, Manilva, Calahonda, Mijas Costa, Fuengirola, Benalmadena, Torremolinos and inland areas including Alhaurin, Coin, Monda and Casares. We have been specialists in residential real estate for more than 40 years. During that time the market has changed dramatically as have the tools at our disposal. Despite the changes, the goals have remained the same. Our job is to bring buyers and sellers together and we only earn our fee when we are successful. 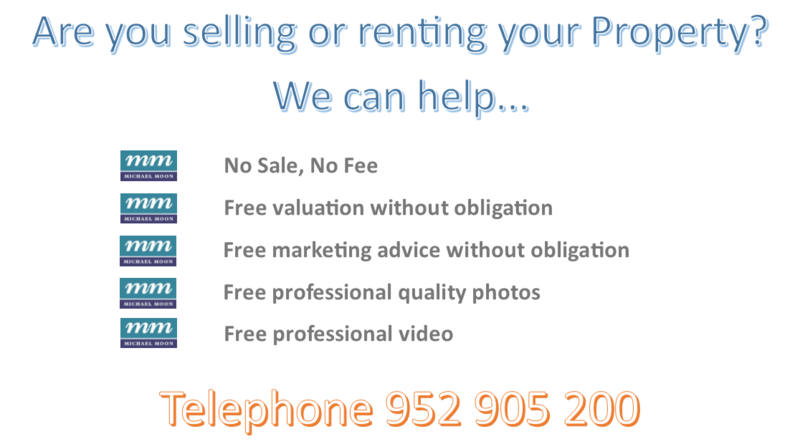 Everything we do is targeted towards finding a buyer for your property. Based in Marbella, we concentrate on the area between Benalmadena and Sotogrande selling apartments and villas for holiday homes and also for permanent living. As one of Marbella’s longest established Estate Agents we have the experience to advise you on all aspects of your sale including maximising the price you achieve. We will use the latest marketing techniques to find your buyer. Unsurprisingly the internet is now the most important tool for marketing, advertising and communication. We will do everything we can to ensure that your property is presented in a thoroughly professional manner with high quality professional photographs, descriptions in multiple languages and, of increasing importance, with professional video presentations showing everything that your property has to offer. Social media has a tremendous influence on all of our lives and we now use it extensively to bring the details of your property to buyers from all over the world. We also work in collaboration with most of the agents, large and small, on the Costa del Sol using the most effective market leading multi listing platforms to make sure that you have the best chance of finding a buyer. Property Portals are also important in generating interest for your property and we are continually updating our use of the protals to ensure that we are using the most effective and relevant to help sell for you. We are also members so of the ReSales Online and InfoCasa property sharing systems which help us ensure that your property is made available to the vast majority of Real Estate Brokers here on the Costa del Sol, furthermore increasing the opportiunity to achieve a sale. In order to take the first steps towards your sale please give us a call and we will discuss all the options with you in order in order to formulate a pro-active plan to achieve the best possible result. Non-Exclusive sales agreement, no time limits, no obligation.